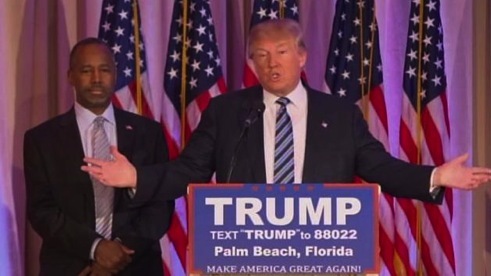 Former opponent Ben Carson sided with Donald Trump Friday. No network has been more slavish in its coverage of Donald Trump than CNN. That’s probably stating the obvious at this point, even though rival networks certainly haven’t scrimped on the free time they’ve given the oft-bombastic Republican Party frontrunner. It would be nice, however, if CNN also would take the time to at least call Trump on his many and obvious twists and turns of what he claims is the truth. It takes very little effort to make such an effort, as very recent events demonstrate. Immediately following CNN’s Republican candidate debate Thursday night, the network of course went immediately to Trump onstage. His new caddy, Chris Cuomo, again was the questioner. During the course of their live interview, Cuomo asked Trump whether he’d be doing more debates during the primary season. It’s Trump’s view that the electorate has seen enough of them at this point while networks enjoy “making a fortune” off the high ratings for the Republican debates in particular. Still, he told Cuomo, “I think they want to do two more debates and I guess I’m pretty much OK with it.” After all, Thursday’s notably tame face-off turned out to be “a very elegant evening” in Trump’s opinion. Cut to Friday morning, when CNN of course provided uninterrupted wall-to-wall coverage of former foe Dr. Ben Carson’s endorsement of Trump and their subsequent lengthy press conference. A reporter asked Trump about the planned March 21st GOP debate in Salt Lake City, which has been sanctioned by the Republican National Committee and was first announced on Feb. 20th. This time Trump played dumb. Perhaps he also didn’t know that the CEO and COO of Wounded Warriors Project were fired Thursday for misusing the funds donated to the organization, including spending some $26 million on lavish parties and conferences. So, not a good charity at the moment, Mr. Trump. In outlining his reasons for endorsing Trump, Carson said there “are two different Donald Trumps” and the one behind the scenes is “very cerebral” compared to the insult-heaving Trump on display at rallies and debates. “We buried the hatchet. That was political stuff,” Carson said of Trump’s previous attacks on him, which included likening Carson to a child molester with a “pathological” disease. Trump later said. “I probably do agree. I think there are two Donald Trumps.” And although “I don’t like to over-analyze myself,” Trump said he’s a “big thinker” behind the scenes. Then he repeated another of his calumnies, that opponent and “absentee governor” John Kasich said he would quit the race if he didn’t finish atop last Tuesday’s Michigan primary. He’s wrong. In truth, Kasich has said it would be time for him to drop out if he didn’t win his home state of Ohio. And he’s been emphatic in saying he will beat Trump in Ohio. He never predicted victory in Michigan, but said that his campaign needed to do very well in the state. Kasich ended up finishing a sliver behind second-place Ted Cruz, by less than 9,000 votes, while both of them had more than 200,000 votes than a very distant fourth-place Marco Rubio. These are all easy misstatements to scrutinize. But in her post-press conference edition of CNN Newsroom Friday morning, anchor Carol Costello didn’t correct or clarify any of them. She instead seemed obsessed with her perspective that Carson, unlike previous Trump endorsers Sarah Palin and Chris Christie, did not stand directly behind him onstage. In her view, that meant Carson was distancing himself. Well, the picture above says otherwise. But this is the kind of drivel that too often passes for hard-hitting presidential campaign coverage on a network that has adopted Trump as its latest missing Malaysian airliner. In other words, CNN simply can’t cover him enough. CNN and other networks say that Trump is the frontrunner, after all. And that unlike other candidates, he readily makes himself available. That’s the rationale currently in use on MSNBC’s Morning Joe, whose host, former Republican congressman Joe Scarborough, has been assailed in some quarters for being a close friend and ad hoc advisor for Trump’s campaign. Well, CNN always wants to do an interview. And its subsequent analysis of Trump’s latest pronouncements almost always includes a Trump campaign mouthpiece who deflects any and all criticisms. When did this get to be the norm? However this election turns out, volumes could be written on how CNN in particular gave Trump one free ride after another. Events between late Thursday night and mid-Friday morning were yet another instance of a network failing to point out his all-too-evident inconsistencies or untruths. Oftentimes he contradicts what he’s said just a few minutes earlier. It’s very basic journalism to point this out. But just as often as not, CNN seems all too inclined to instead look the other way.